Spend two weeks driving through British Columbia’s stunning west coast and islands. Not many other areas in Canada offer such a rich array of scenery, wildlife, and culture. Discover hidden gems such as Princess Louisa Inlet with its soaring cliffs and magnificent waterfalls. Travel to the windswept beaches of Pacific Rim National Park, before visiting charming Salt Spring Island with its flourishing arts community and local food producers. This trip has so many unique experiences to offer, you may find it hard to choose! Wildlife viewing, adventure activities, and rich cultural experiences are all what make Canada’s West Coast so exciting. You’ll be sure to finish your vacation feeling inspired and awakened. With relatively short driving distances, you’ll find yourself hopping from mountains to misty coves, to rugged beaches and old growth rainforest. At each turn in the road, you’ll want to stop and savour the breathtaking scenery before you. Along the way, explore sophisticated Vancouver, charming Victoria, and quirky Ganges on Salt Spring Island, just to name a few. This blend of big city attractions and artisanal hamlets will be as thrilling as the natural setting around you. Overnight at The Listel Hotel. This is an intimate Robson Street boutique hotel perfectly located in Vancouver’s premier shopping district. Enjoy well-appointed, stylish rooms with thoughtful amenities such as complimentary wifi, comfy robes and room service if needed. Recharge at the fitness centre, reward yourself with a glass of wine at the daily wine receptions and dine at one of the two on-site restaurants for some delicious gourmet food and cocktails. Join a carefully-selected culinary experience to some of the many mouth-watering places to eat on a local Vancouver walking food tour. Depending on the day of the week, your tour can bring you through neighbourhoods such as historic Gastown, Granville Island Market, or downtown Vancouver. Today you will explore Stanley Park, a cultural mecca and ecological wonder. It is the perfect place to take part in a First Nations interpretive walking tour! Your guide will share the many stories of this region, as well as the intimate cultural and scientific knowledge of the Northwest coast trees and plants. Accessible only by ferry or air, this strip of beaches, cedar forests, hiking trails, summer cottages, and artist colonies is just 2 hours away from Vancouver! The ferry ride takes 45 minutes and boasts the most stunning scenery. Today, you make the scenic crosswater journey from West Vancouver to the Sunshine Coast. En route, keep an eye out for wildlife along the shoreline, killer whales and porpoises in the channel, and great bald eagles circling overhead. Overnight at the Painted Boat Resort. Situated on the Sunshine Coast, each villa at the resort offers upscale, Canadian-design and water views, along with amenities that include a marina, spa, saltwater plunge pool, hot tub and sauna. There is a zen gazebo for yoga or Tai Chi sessions and kayaks and paddle boards are available to rent. Be sure to eat at the on-site restaurant that highlights fresh Sunshine Coast ingredients! Marvel at stunning landscapes, waterfalls, native pictographs, glaciers and early settlement areas as you discover Princess Louisa Inlet on a guided boat tour. On a guided hike, explore the rich ecosystem of Smuggler's Cove Provincial Park with an indigenous guide. Learn about local plants that Indigenous people have harvested for food, medicine and technology for thousands of years. Paddle with a First Nations cultural ambassador through stunning inlet waters of Sechelt Inlet. You will witness first hand the diverse and abundant wildlife of this region with countless birds, including eagles, cormorants, osprey, scooter, and mallard ducks. Other highlights include storytelling and ecological, cultural, and historical interpretation of this rich and diverse area. Venture to the northern tip of the Sunshine Coast, take a short ferry ride to Saltery Bay and then enjoy another ferry journey across the Strait of Georgia, past Texada Island and finally, on to Courtenay on Vancouver Island. The crosswater journey from Earls Cove to Saltery Bay is a short but scenic 50 minutes to your destination. Today, you make the scenic crosswater journey from Powell River to Comox. Overnight at the Kingfisher Oceanside Resort & Spa. Nestled in a coastal forest on the eastern shore of Vancouver Island, this resort offers breathtaking ocean and mountain views. Pamper yourself at the spa, relax in the hot-tub, steam cave or sauna followed by some laps in the pool. Enjoy a cocktail in the wine bar while taking in the stunning island views before dining at the on-site restaurants or bistro if you'd like! Overnight at the Black Rock Oceanfront Resort. This beautiful property offers an extraordinary retreat on the stunning coastline of West Vancouver Island. Steps from the Wild Pacific Trail and near downtown Ucluelet, you'll enjoy your well appointed room with thoughtful amenities. Features include a bar and restaurant, outdoor patio, a spa with two hot tubs and a plunge pool. Sip a cocktail in the lounge while enjoying the view of the ocean, the perfect spot for sunsets and storm watching! Old-growth rainforest and the Pacifc Rim beckon to be explored and we have lots of ideas to help you enjoy it today! Enjoy an exciting boat ride while you watch for whales in Barkley Sound, and kayak though Broken Islands – all in one day! Kayak through quiet coves and tiny islands, and discover the intertidal splendor and abundant wildlife in Pacific Rim National Park. Relax on a white sandy beach for a gourmet picnic lunch. Ride along Vancouver Island's stunning coastline in a covered boat, making wildlife viewing stops as you go. After a rainforest walk, take some time to relax and soak in some natural hot springs. Enjoy the opportunity to view Gray whales as they migrate close by the shore on the way to cold Alaskan waters, where the food is. Some feed all summer along their coastline. Humpback whales, most of which migrate from Hawaii to Alaska, have become more common in Barkley Sound. The Orca (Killer whales) are seen occasionally but are less predictable. You may also get to see other marine mammals, or even a bear. Long, uninterrupted stretches of sandy beaches are the main attraction. 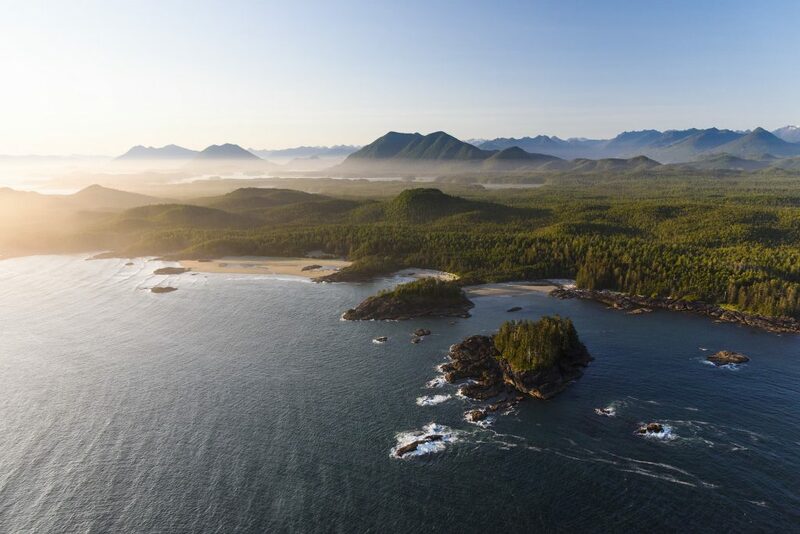 Ucluelet and Tofino are part of the UNESCO designated Clayoquot Sound Biosphere Reserve, a protected area providing habitats for a vast array of species, a significant number of which are endangered or rare. The small fishing village of Tofino is situated on the west coast of Vancouver Island and is a popular tourist destination for visitors from around the world. In the winter, everything slows down, however there are still a number of travelers who come to see the storm season. A long-time haven for artists and artisans, Tofino is having a renaissance of sorts, with newfound international praise for its craft breweries, farm-to-table restaurants and the sheer beauty of the natural world that surrounds it. Today, you drive across Vancouver Island to Victoria, located on the southeastern side of the island. A road trip is one of the best ways to explore Vancouver Island. Overnight at the Magnolia Hotel & Spa. Situated in the heart of downtown Victoria, your hotel is steps from the picturesque Inner Harbour. The Parliament Buildings, galleries, shops and dining are also nearby. During your stay enjoy elegant luxury rooms, a spa, fitness centre, infrared sauna, business centre and fine dining options. Why not explore the city with complimentary guest loaner bikes? Adorned with flowers and colonial architecture, Victoria is a wanderer's paradise. Admire the beauty of the ocean and reflect on the area's history as you explore this vibrant city. Find yourself standing above a fjord taking in the stunning views of the Gowlland Range, the Strait of Juan de Fuca and the Olympic Mountains on this hiking tour. At the end of the hike, you'll be at a viewpoint worth bragging about! During this relaxing guided tour of Victoria's Inner Harbour, you’ll get a chance to see the bustling activity of seaplanes, ferries, boats coming and going, all with the stunning BC Legislative Building and the historic Fairmont Empress as your backdrop. You may also encounter eagles, herons, river otters, seals and seagulls. Enjoy exploring the Butchart Gardens, a National Historic Site, with your admission included. The tour leaves at various times throughout the day from the Fairmont Empress kiosk with multiple return departures from the Gardens. The choice is yours. Pop over from 'the big island' to Salt Spring on this quick, scenic crossing. Overnight at The Hastings House. The small country resort sits on 22 acres of waterfront on beautiful Salt Spring Island. Enjoy luxury lodging, fine dining, wellness and relaxation in a casually-elegant atmosphere. Start the day with a complimentary breakfast, enjoy a spa treatment in tranquil surroundings or indulge in afternoon tea. Salt Spring Island, the largest of the Gulf Island, is famous for its farmers, artisan producers, and organic vineyards. Wildlife, nature, coastal activities, and getting away from the hubbub are top reasons to visit. Embrace your inner gourmand as this tour shows the full spectrum of Salt Spring’s unique culinary community and its offerings. While touring the town of Ganges and the north and south of Salt Spring Island you will be treated to the locally made beer, wine, spirits, cheese and bread. A great way to see the best corners of Salt Spring Island, both on and off the beaten track. Start in Ganges and work your way around the island, visiting local artisans in their studios. Take a stroll through the gorgeous Pacific rainforest, stop at multiple viewpoints and don't miss the samples at the cheesemaker's! Enjoy a leisurely drive and scenic ferry ride through the gulf islands, as you head back to Vancouver. Today, you make the scenic crosswater journey from Salt Spring Island to Vancouver. Sit back, relax and take in the beautiful views as you make your way back to the mainland. Overnight at The Fairmont Vancouver Airport Hotel. This hotel is the only soundproofed, luxury hotel and spa conveniently located within Vancouver's International Airport. The hotel is situated directly above the US departures terminal - a two-minute stroll from the luggage carousels, no shuttle is required. Features include a self-service check-in kiosk in the hotel lobby, floor-to-ceiling views, diverse dining choices and an indoor pool, health club and spa. Overnight at the Wedgewood Hotel & Spa. Enjoy your stay at this elegant, world-class property set in the heart of Vancouver’s downtown core. Be sure to check out the award-winning Bacchus Restaurant & Lounge offering up an unforgettable epicurean experience in an elegant romantic setting. This trip is available for departures between May and October. We had a wonderful time in Canada! I am very pleased to say that everything went very smoothly and without a single problem or hassle. We were very impressed with the organisation of our holiday – every transfer/tour arrived promptly on time and at the designated place, all the drivers/guides were fantastic (polite, friendly, and informative), and all the hotels were great and the rooms all had the promised views. Even the weather was good to us! All-in-all, a wonderful, trouble-free trip – thank you and well done! We will certainly recommend you and Fresh Tracks to our friends.